Yesterday morning, the last levee on Inner Bair Island was breached. The salty waters of the San Francisco Bay gurgled into its sloughs and began reclaiming the land that had been diked off decades ago. And so came to fruition a 33-year long project to restore all parts of Bair Island to marshland. December 10, 2015 began with rain. Moseying along through bumper-to-bumper traffic on US 101, I reached the spot planned for the Bair Island Restoration Celebration in Redwood City, California. Dodging a few raindrops, I mingled with volunteers, US Fish and Wildlife Service staff, and people from many organizations who all had a part in restoring Blair Island. The sun came out and we trudged through mud to the raised viewing platform and then to the area where the levee would break. Clyde Morris, former manager of Don Edwards San Francisco Bay National Wildlife Refuge, described the history of Bair Island. Other speakers from Citizens Committee to Complete the Refuge, Friends of Redwood City, California Department of Fish & Wildlife, Peninsula Open Space Trust, and Ducks Unlimited spoke about the significant and long-term advocacy efforts they undertook to restore Bair Island's historic 3,000 acres of tidal wetlands. One speaker described the 1982 voter referendum drive to overturn a proposed development on Bair Island as a “pickleweed-roots” campaign. Subsidence on these islands from the farming, salt pond harvesting, and other uses had to be fixed with over 1.5 million cubic yards of fill. One innovative idea, saving money too, was the use of fill from dredging and other sources that normally have ended up in a landfill or the ocean. A pilot project that worked well and I hope sees many more applications in the future. Video of Bair Island Levee Opening on Dec 10, 2015. I spoke to kayakers who had recently paddled through the narrow, winding sloughs of Bair Island. They told me that they had already spotted harbor seals and other wildlife in the marshlands restored through levee breaks in the Middle and Outer Bair Islands. It felt wonderful to see this area change back to its original state and to see wildlife inhabit it. Bair Island, with its sloughs and former salt ponds, as depicted in the report Bair Island Restoration And Management Plan: Appendix D - Existing Hydrologic Conditions Assessment (2000). The San Francisco Bay Wildlife Society (SFBWS) supported early work on the Bair Island restoration project around year 2000. SFBWS is a Friends group for the San Francisco Bay National Wildlife Refuge Complex and has been a supporter of the National Wildlife Refuges of the San Francisco Bay region for over 28 years. I hope SFBWS can continue to help big projects like these move forward. Restoring wetlands, helping grow and maintain wildlife habitat, and providing environmental education need volunteer hours and donor dollars plus a commitment from all of us. Here's looking forward to the public opening of the Bair Island trails soon! * Bair Island was part of San Francisco Bay's 195,000 acres of inter-tidal, wetland habitat. * In the late 1800s levees were built on Bair Island to drain the marshland and make the land suitable for agriculture. * In the 1920s, the island acquired its name from farmer Fred Bair who owned a home on the island and raised cattle on the land. * In the 1940s, the Leslie Salt company acquired Bair Island and built levees between 1948 and 1952 that divided it into three sections — known today as Inner, Middle and Outer Bair. Parts of the three islands became salt evaporation ponds and were harvested by Leslie Salt until 1965. * In 1973, Mobil Oil Estates purchased Bair Island from Leslie Salt. The land was approved by the Redwood City government for a development of 20,000 homes, a shopping center and a corporate office complex, named South Shores. Outer Bair Island ownership moved to California States Land commission at the same time and began to see planned and unplanned tidal action, but not the rest of Bair Island. * In 1982 a referendum by Redwood City citizens, called Measure O and led by Ralph and Carolyn Nobles, passed by 42 votes out of almost 18,000 cast and reversed that housing development plan. * In 1989 Mobil Oil sold Bair Island to the Japanese firm, Kumagai Gumi. Under pressure from Bay Area environmentalists, the firm agreed to sell back the land. * In 1996 the Peninsula Open Space Trust bought Bair Island and made it part of the Don Edwards San Francisco Bay National Wildlife Refuge. * In 1997 the Bair Island Ecological Reserve was established. 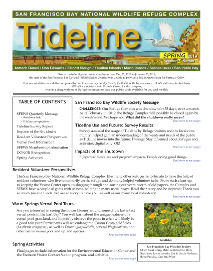 This story by Public Affairs Officer Doug Cordell originally appeared in the Fall 2010 issue of Tideline, the newsletter for the San Francisco Bay National Wildlife Refuge Complex. Buxton, B. (2011). Staff recommendation to Coastal Conservancy: Middle Bair Island wetland restoration.